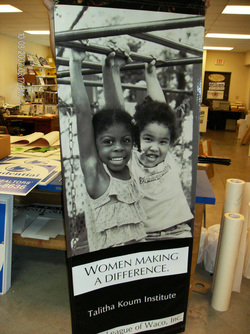 carry several types of banner suitable for indoor/outdoor advertising use including a non scrimm banner that can be printed on both sides. Finishing services include: grommets, hemming, pole pockets, and welding. We carry several grades of paper thickness from 140G, 212G and a 212G High Gloss. Prints can also be laminated, encapsulated or mounted on a variety of substrates like coroplast, pvc, and gatorboard, or set for framing.